If you’ve ever used Siri, Alexa, Cortana, or Google Assistant you’re a part of the voice search revolution. Artificial intelligence powers voice-enabled “assistants” in your smartphone or smart speaker that, at this point, are almost as good as humans at recognizing speech. 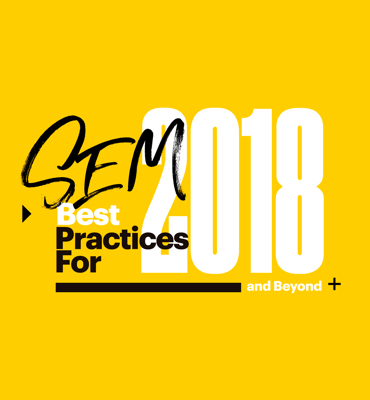 As you might suspect, there are differences in search patterns between spoken and typed queries. These differences and the strategies needed to optimize for voice search is voice marketing. Technology is advancing at break-neck speeds, and it can be hard to keep up with new trends and discoveries. Staying informed about innovation that can shape the future of your industry is important, but there aren’t enough hours in the day to dive deep into every topic. Here are some reasons we think voice marketing is the next big thing, and definitely worth your attention. 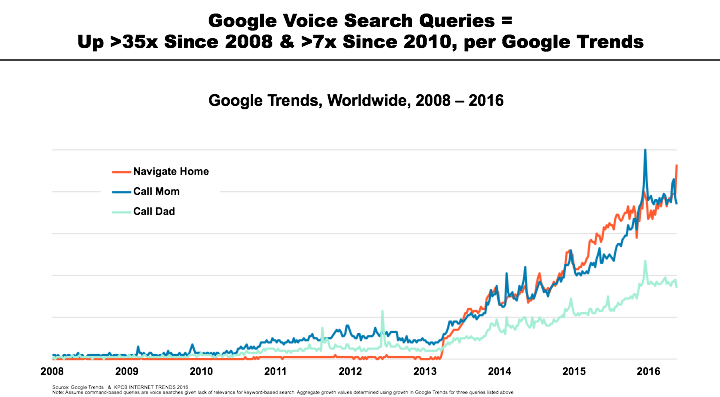 The use of voice search has been trending upwards at lightning speeds for more than eight years, with a 35-fold increase between 2008 and 2016. 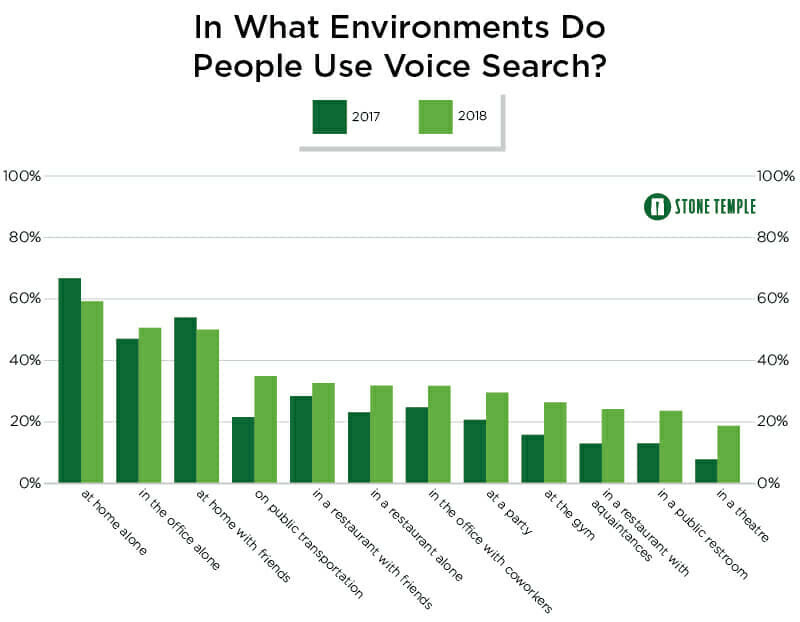 The chart below also demonstrates the fact that the use of voice search has increased 7X since 2010, with certain voice actions really picking up in the last 3-4 years. So the use of voice search is growing, but does it really pose a threat to good-old-fashioned touchscreen typing? It might, since it’s estimated that half of all searches will be voice-based by 2020. Early adopters of new technology may feel like black sheep, but research shows that people are becoming more comfortable with the idea of talking to artificially intelligent programs on their phones while in public. Voice assistants are still used most often when someone is alone, but in 2018 the percent of people willing to use a voice assistant in public, such as at the gym or in a public restroom, has increased. This willingness to, seemingly, talk to yourself highlights the fact that voice assistants are becoming a regular part of society. Using a voice assistant while home alone is still the most popular environment to use voice search in. This device market is also expected to grow. Amazon Echo’s Alexa dominates the voice-assisted smart speaker industry with 70% of market share, but Google Home is another top contender. Additionally, the number of voice-assisted devices in homes is expected to rise to 67 million by 2019. Voice assistants on smartphones are also on the rise. 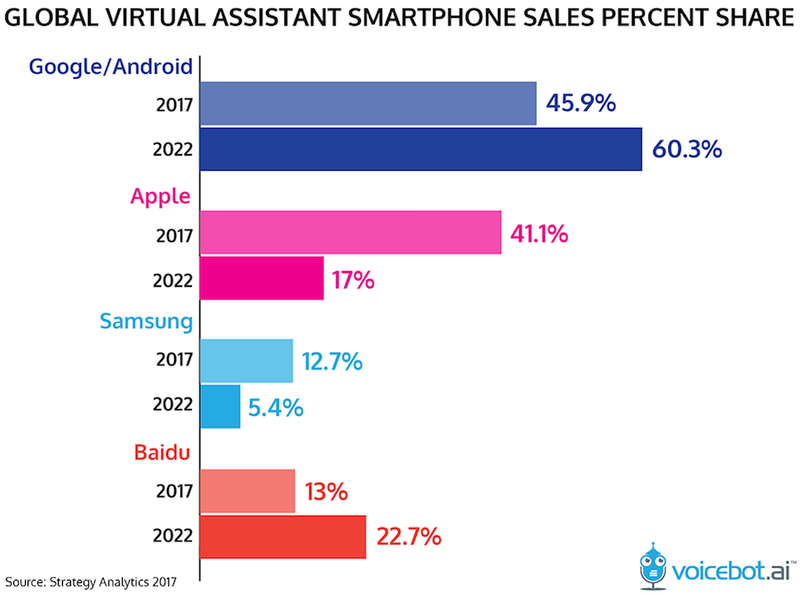 The chart below shows predictions from Strategy Analytics for the growth of voice-assisted smartphone market shares in 2017 and 2022. The firm has Google and Baidu making significant strides in market share and has percentages over 100% because they predict some consumers use more than one voice assistant. 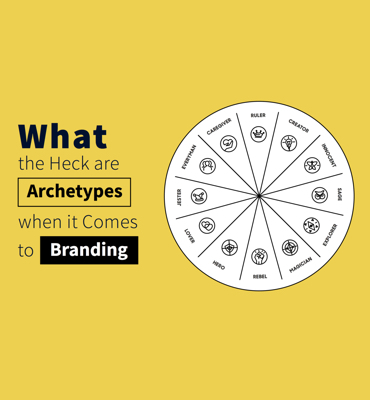 Big brands are getting on board and seeing results. For example, Patron launched an Amazon Echo “voice skill” to coordinate with their Cocktail Lab campaign. Bartenders from around the world crafted cocktails featuring Patron, and users could browse tequila-infused drinks via their voice-enabled devices. Patron reported that 10% of the 350,000 users who took advantage of the Cocktail lab came from their Amazon Echo, and Echo users spent more time browsing the website and recipes than other devices. Tide also has a voice-powered app that talks users through removing stains. In an environment where design and branding don’t matter, voice-powered content needs to be useful above all else. 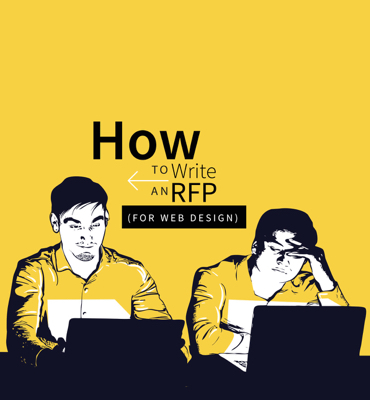 Other companies have caught on to this early content marketing strategy as well. Zyrtec offers a daily AllergyCast that not only lets you know what the pollen count in your area is, but records how you’re feeling each day to pinpoint what allergens could be the cause. As consumers become more comfortable with voice-assistants and devices are in more homes, companies have an opportunity to be an everyday resource that strengthens brand connection. On first thought, voice search may seem most relevant to retail companies that can tailor their strategy for local searches. However, the wide range of uses that voice assistants offer proves that there are nearly infinite uses in every industry. Currently, Amazon Echo’s Alexa comes standard with 1,900 “skills,” or tasks it can complete on demand; Plus, more than 25,000 skills can be added to fit a user’s specific needs. Commands range from calling an Uber, to placing an order at Starbucks, to checking current wait times for airport security lines. The current and expansive selection of skills available to users points to a future where voice assistants are an integral part of everyday life. It will be interesting to watch how industries and brands adapt and innovate to take advantage of the voice search trend. Voice search will have an impact on your local SEO strategy, but the technology is also a global phenomenon. Adoption rates for voice assistants are higher in India than in the U.S., at 55% versus 46%. Also, Chinese consumers have voice search activity levels that are higher than global averages. Voice recognition accuracy is on the rise across AI programs, and so is the number of languages voice assistants understand. Google specifically is compatible with more than 100 languages, expanding its usefulness to more international users. 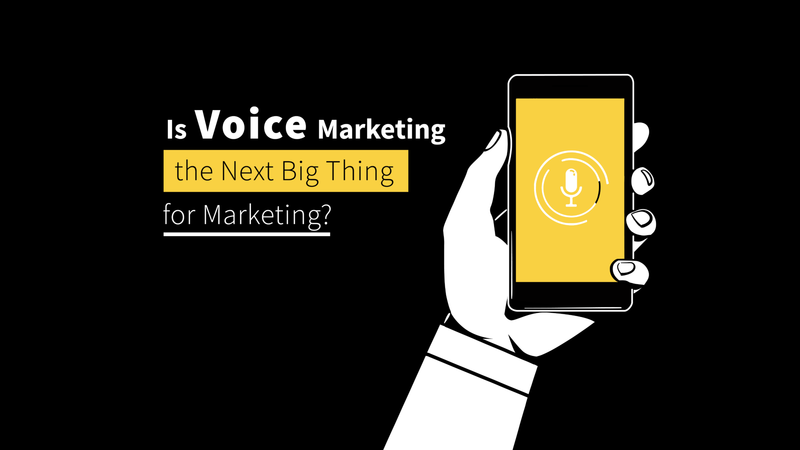 How will voice marketing impact strategy? For starters, expect a shift towards conversational voice queries and natural language processing. Additionally, voice search queries are more likely to be local. Think “where’s the best pizza place near me?” Voice search queries also tend to be longer, since humans can speak an average of 150 words per minute, versus typing only 40 words per minute. To get ahead of the competition, check out our guide to 5 Ways to Prepare for Voice Search in 2018.